Talk about a sapphire ring and your mind presumes that the jewel is adorned with a blue sapphire gem. Sapphire which is gem quality corundum (mineral) comes in a wide spectrum of colors. With limited knowledge in ancient times, the belief that all sapphires are blue was understandable. Scientists have today proved that sapphires can be white, yellow, blue, green, pink, orange, purple and a dozen hues within these colors. Kaisilver with its unmatched expertise in gem procurement and custom cutting, is always on the look out for interesting gems. The idea is to offer the best gems at each price point. The RG233 pink sapphire ring can be ordered in white, yellow or rose gold. High end jewelry like we craft, is generally made in 14k or 18k gold but, if you prefer to have a 10k sapphire gold ring, do email our support team with your requirements. The ring does have a stylish and slender look but, it is surely not flimsy and light weight. We will craft your ring in solid gold without scooping any metal from the ring. You can choose a sapphire with the color of your choice, interest in colored gems is high and we wish to equip you with as much choice as possible. By maintaining the same quality standards for both gold and silver rings, we ensure that a wider range of budgets can consider buying this sapphire ring. If you choose the square sapphire gold ring, let us know if you would like to have it made in 10k, 14k or 18k gold. Don't forget that the gold color can be an added point of interest and beauty for this ring. Rose gold has a pastel pink color, this allows almost all gems to reveal their true beauty. White gold is all about brightness, color contrast with the gem is very clear and glaring. Many jewelry buyers would prefer to wear a yellow gold pink sapphire ring, for them yellow is the only 'true' gold color that gives the jewel a luxury and valuable look. The choice of gold color is yours and you could also specify your preference for an 18k, 14k or 10k sapphire gemstone ring. A silver sapphire ring would have a classic look, the metal today appeals to many quality conscious buyers. Plating a sterling silver ring with white rhodium, yellow gold or pink gold might instantly give it a an extravagant look but, nothing that is plated on silver lasts permanently. Let us know at the time of ordering whether, you wish to have a plating done and we can do it for you. Just remember that, even this plating will wear off with time. The ring is shown with a pink sapphire, you can choose a white, yellow, pink, blue or orange sapphire. The sapphire gold ring can be ordered in 10k, 14k or 18k gold, choose white, yellow or pink gold. The gold and 925 silver square sapphire rings have the same quality of gems and workmanship. Since any plating on silver will come off after some time, we recommend that no plating be done. Since each ring is fully custom made, we can accommodate requests for all ring sizes. The center gemstone is a 6mm square sapphire but round, oval or heart shape is also possible. The RG233 ring has a metal weight of 8 to 10 grams, no scooping is done inside the band. You can request for a short message or name to be etched inside the band of your sapphire ring. The bezel setting for the gem firmly secures the sapphire, the entire border of the gem is covered. The ring can be ordered with any gem of your choice, we place no restrictions on gem selection. We can also craft your sapphire gemstone ring with a design or sketch provided by you. How To Buy: Since all Kaisilver jewelry is high end and custom made, we suggest that you decide your requirements with our experts before, deciding to purchase. The team performance is evaluated based on quality of solutions that they provide rather than, on sales orders that we receive. Provide details like choice of metal, approximate ring size, choice of gem etc. We can custom make your ring based on your own design, there is absolutely no limitation placed on gem selection. Email our support experts at sales@kaisilver.com and ask as many questions that you wish to, you will never be obliged to make a purchase. You should therefore take full advantage of their expertise in all aspects of gemstones and jewelry. Payment And Shipping: While we accept payment through Paypal and Western Union, we recommend Paypal for first time buyers. Let us know which mode of payment works for you and we will provide details for the same. Since each jewel is completely made to order, the production time is 4-6 weeks from the date that we receive payment. Shipping will be through FEDEX with web tracking, you will receive tracking details the moment the parcel ships. A shipping fee of 35 U.S$ covers most destinations, we will provide details once we receive your query and before you make a payment. Inspired by nature, our designers chose the flower motif for this pink sapphire diamond ring. A well crafted sapphire gemstone ring, you can order this gorgeous ring in 925 sterling silver or gold. 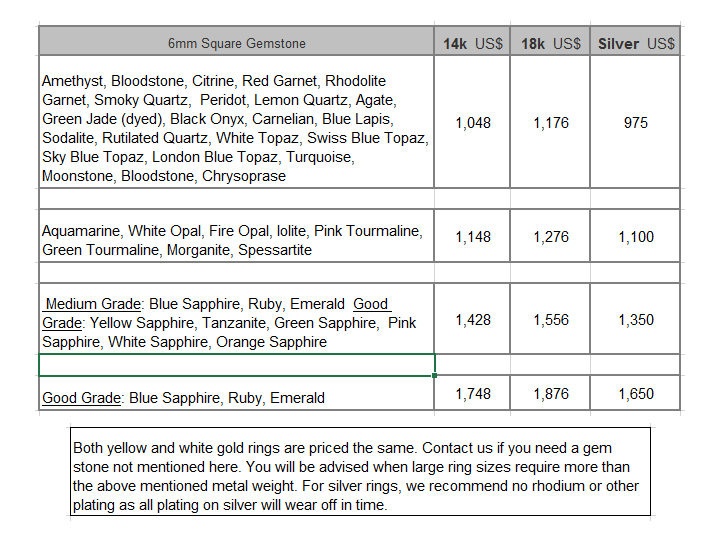 You can request for white, pink, green, yellow, orange or blue sapphires for your ring ... more. Kaisilver: As the leading online high end custom made jewelry provider, we craft both gold and silver jewelry with the same quality standards. The designs for your jewelry can be yours are ours, we place no restrictions on design or gemstones. Being directly networked to leading gem providers and most of the gem mining operations across the globe, we have preferential access to more than 200 million carats of gems. 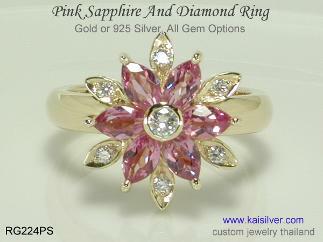 Over 7,000 discerning gem and jewelry lovers across the globe proudly wear, jewelry and gems sourced from Kai Silver. Contact our support experts at sales@kaisilver.com for any questions or requirements that you might have. You can request for your sapphire ring to be crafted with a design concept provided by you. 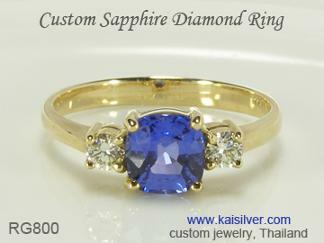 The sapphire ring collection from Kaisilver offers some gorgeous rings for you to choose from. The same quality standards are maintained for gold and 925 sterling silver sapphire rings ... more.